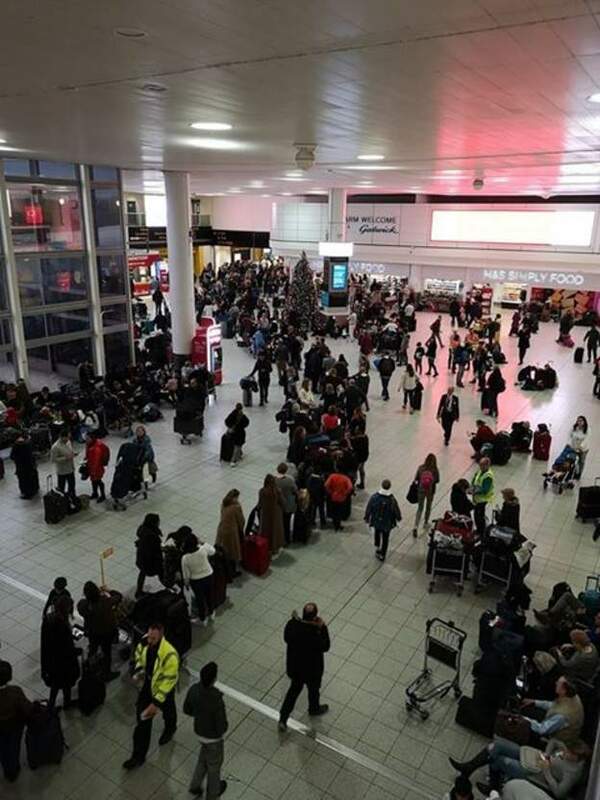 London Gatwick, England's second busiest airport, has been closed for almost two days due to what police are calling a deliberate criminal act involving two drones. The nightmare began at around 9pm on Wednesday when airport officials noticed a pair of drones flying around the runway. As this is a threat to aircraft, the airport was completely closed. At 3am the following day, the airport reopened, however within just 45 minutes the drones had returned, causing the airport to close again, and it hasn't reopened since due to repeated drone sightings. On Thursday, the Government called an emergency meeting to discuss how to remove the drones, and shortly after armed police officers and even army officials were dispatched to the airport's runway, with the intention of preventing the drone from flying, possibly by shooting it down. However, this has been considered to be a threat as debris and/or missed bullets could hit other targets unintentionally. Above: Armed police at Gatwick. This incident couldn't have come at a worse time. Just days before, Gatwick claimed the Christmas 2018 season would be their busiest ever, and the closure has cancelled over 700 flights, causing thousands of Christmas plans to be placed in jeopardy. Due to how late the incident first began, Gatwick and the other London airports were completely full, meaning that aircraft due to land have been forced to divert to airports. Aircraft originally began diverting to Birmingham and Manchester, however these airports also got full very quickly, causing some aircraft to divert as far away as Amsterdam and Shannon. With aircraft stranded at small airports, it would still take days for Gatwick to fully return to normal when it reopens. This has caused completely misery for passengers, many of which are travelling to see family over the Christmas period or for holidays. Social media has blown up with passenger stories of cancelled flights. Highlighted stories include a newly-married couple trying to get to New York for their honeymoon, and a particularly saddening story of a young boy named Teddy who's dream trip to Lapland had been cancelled. The Stewart family were due to fly to Lapland on Thursday. Teddy's mother, Tanya, praised him for being "very brave". "I just feel so bad. I wanted it to be a day to remember for Teddy, one that he will treasure forever," she said. Teddy told BBC News that "My dad, he walked to the front desk of the airport and he asked what was going on, and the lady gave him a letter and it said the flights would be cancelled. I was just sad and upset." Despite the cancellation, he is still optimistic that he will make it to Lapland. "We can do it next year," he said. There is currently no sign of the airport being able to reopen. What do you think about all of this? Let us know in the comments!